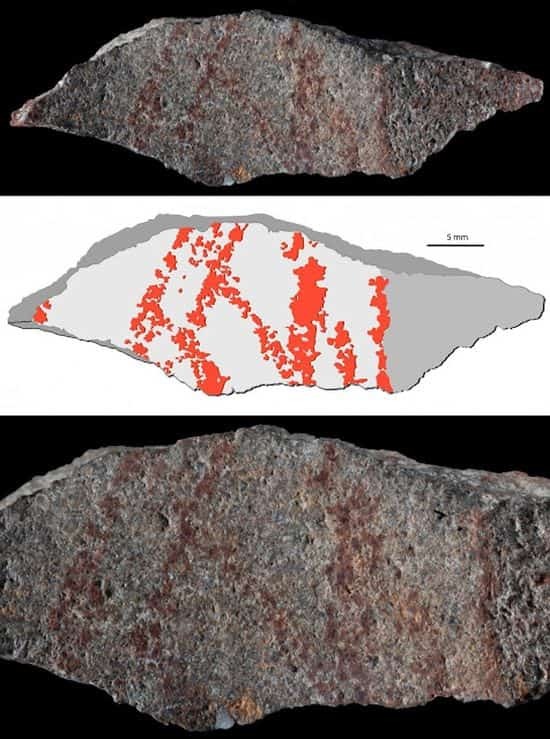 The use of symbols via engravings has a long history that possibly goes beyond half a million years, as suggested by shell found in Java, dated from around 540,000 years ago. But what about the actual prehistoric drawings made by our ancestors? Well, conventional theory dictates that the art of drawing is relatively ‘new’, with the first known specimens dating from the Upper Paleolithic Age, around 30,000-40,000 years ago. However, a recent discovery of a rock fragment in South Africa might just push back this accepted time frame. 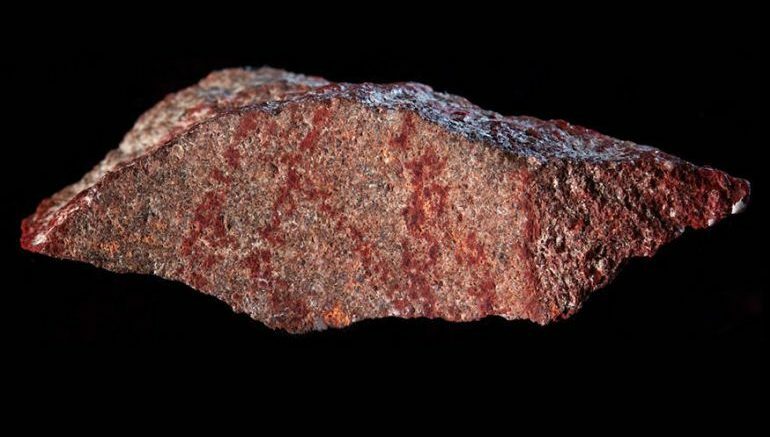 To that end, an excavation conducted at the country’s Blombos Cave yielded a particular rock flaunting intentional strokes of an ocher pencil (on its surface). The fragment came from a 73,000-year-old archaeological stratum. In other words, this (possible) abstract drawing is at least 30,000 years older than the previous earliest known drawing made by humans. Microscopic and chemical analyses revealed the pattern’s reddish lines to be composed of iron-rich ocher, which could only have been applied, since iron oxide does not occur naturally in silcrete. So were the lines a fluke or traced on purpose? The researchers sought an answer by attempting to experimentally reproduce the lines via a range of techniques: using pieces of ocher with either pointed or linear edges to mark strokes on silcrete flakes, or else applying ocher powder mixed with water, at varying degrees of dilution, to silcrete-flake surfaces with wooden-stick brushes. Then, once experimental samples were obtained, a series of microscopy, chemical and tribology (or friction-based) analyses were conducted to compare the motif on the original flake and those produced by the researchers. Results pointed in one clear direction: the crosshatched lines were deliberately drawn by a pointed ocher crayon—sometimes tracing single strokes, at other times multiple strokes—on a surface smoothed by ancient grinding activity, the flake manifestly detached from a grindstone used to process ocher. Qualifying thus as a drawing, the crosshatch pattern takes over the title of the world’s oldest such work, adding a non-negligible 30,000 years to the previous tally. The observation that Early Homo sapiens in the southern Cape used different techniques to produce similar signs on different media supports the hypothesis that these signs were symbolic in nature and represented an inherent aspect of their spiritual world. [Hence researchers, along with neuroscientists, are] currently investigating the emergence of symbolic practices in Kenya, China and the Ukraine in collaboration with colleagues from these countries and other European institutions. The study was originally published in the journal Nature.